I sometimes think it's amazing how quickly culture, science and attitudes evolve. If I look back on my 32 years on Earth, times have certainly changed. As a child of the 80's I had no idea I would live a life with the internet in my pocket for example. One thing that I think has radically changed is the advances and attitudes towards sun protection. Things have certainly come a long way since I was a child. 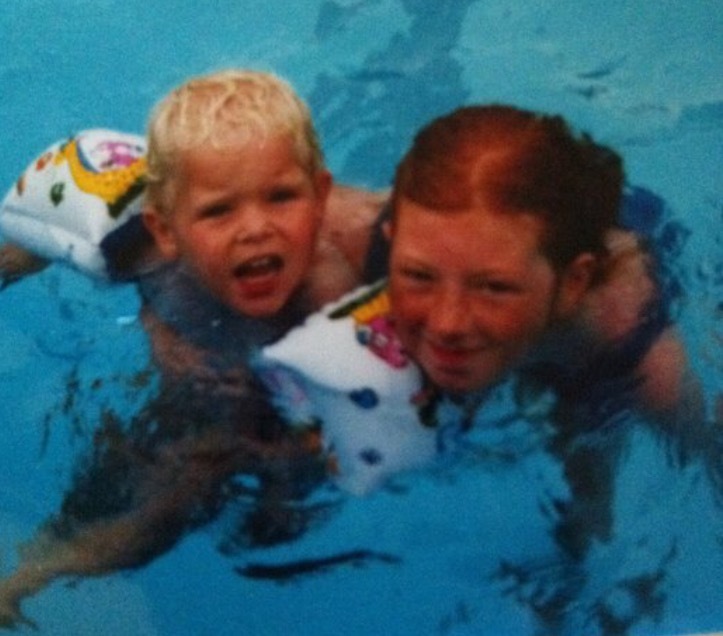 As a redhead with fair skin I burned fairly easily as a child. I remember my mum putting LOTS of suncream on me but it was never enough. 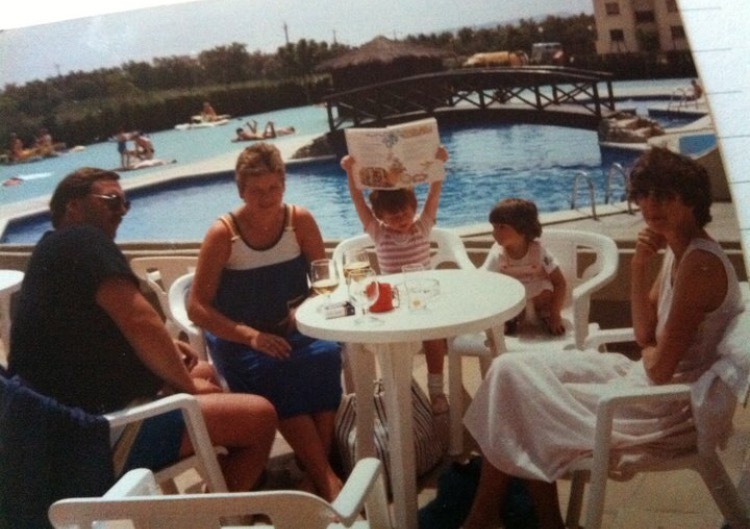 The main memory I have of this holiday to Spain in the 90's is burning my shoulders so badly that they peeled and my skin felt so raw as my poor dad tried to rub aftersun in. I don't think I've ever experienced pain like it. It was horrendous. For the rest of the holiday I had to swim in the pool with a t-shirt on. There was no such thing as UV swimming suits in those days! 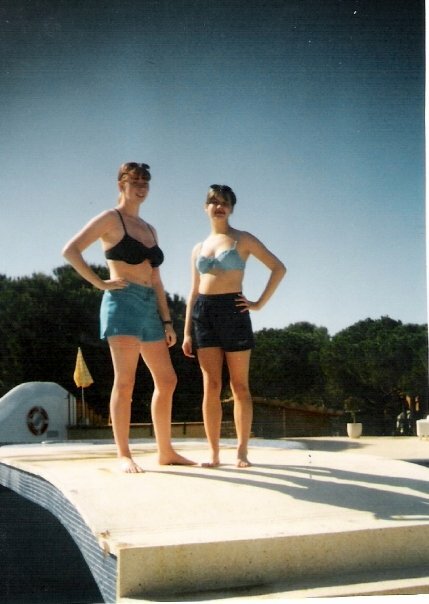 In the early 00's like a lot of girls or my era, I NEEDED A TAN. I shudder when I think of this but our parent's used to hire sun beds and from the age of around 13 years old our group of friends would take it in turns going on each other's sunbeds. I think the risks weren't fully understood then but OMG! I really regret doing this. I don't blame my mam at all as it was absolutely acceptable, normal and common place for teens to do this. I even used tan accelerator on my skin!!! Can you imagine 13 year olds doing this now though? Because I certainly can't. It really is amazing how quickly things change. In the late 00's I had two young children and I'm always conscious that they don't get burned like I did. Thank the lord for UV suits which are a life saver when you're on holiday (especially abroad) and offer good protection from the sun. These have always been available even when my children were babies (although they weren't as common and were more expensive then). I like how these days most supermarkets even make these suits and they are usually accessible and affordable to all. 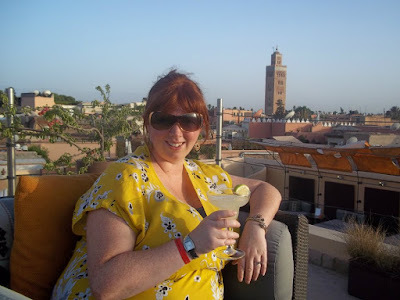 It was during our holiday to Marrakech that I first discovered sun cream that you can wear all day. At first it seemed to be too good to be true. It was a little more expensive than 'normal' sun protection but we decided to give it a go. It works by creating a very thin film over your body to shield it from the sun's rays. Ideally you should apply 15 minutes before going out in to sun and you actually should re-apply every 6 hours I think. OMG I can't tell you how life changing this was! Steve and I (both redheads) walked around Marrackech in mid-July when the temperatures were near 50 degrees and didn't burn once. Once per day sun cream was a real game changer for us! Fast forward a few years and the range of sun screen available has never been greater. 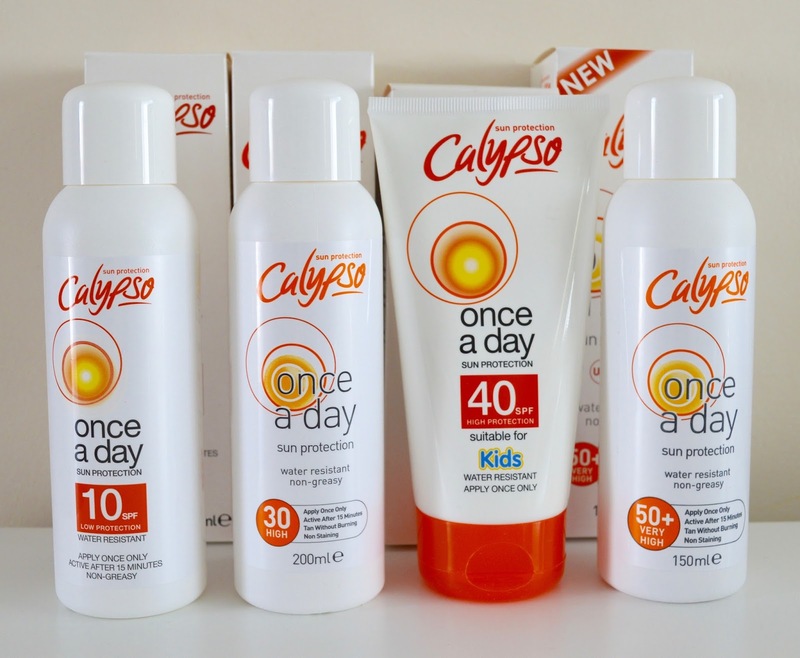 For our up-coming holiday to Spain we have decided to go for Calypso Once A Day Lotion that has been especially formulated to protect children's skin. It is water resistant and provides 4* protection against UVA and UVB rays. The online reviews state that it's very easy to absorb too. Obviously we will still be applying common sense - my three will mostly be spending their days in their UV swimsuits which have long sleeves, legs and hats and I'll keep them out of the sun around midday when the sun is at it's most damaging. I plan to apply their 'once a day' sun cream in the morning before we head out for the day and then I will re-apply again after lunch (you don't really need to do this but it feels weird if I don't). I honestly can't explain how reassured I am that the kids have this kind of protection and won't have to endure the horror of sunburn. I also like that I don't have to re-apply every 2-3 hours like I would with traditional sun screen. Anyone who has kids will know how hard this is once they are on the sand or in the water. Have you tried 'Once a day' sun screen? What did you think? Haven't tried once a day cream yet. But I'll certainly be getting some before the holidays. Haven't tried once a day cream yet. But we will certainly be getting some before the holidays. I actually use this sun cream. Once a day creams aren't as good for protecting your skin against the harm of ageing rays I don't think BUT when you have little kids you don't have time to keep reapplying your own creams as well as theirs so I put this on in the morning then just forget about it. I've never burnt using it either. It's really affordable too. Love it. I wear suncream every day, It's a great moisturiser for one and I've been using the once a day stuff for a few years now, I always look a healthy colour in summer and I never burn. Thinking back to my childhood, I remember my mum buying a sunbed and dad built her a room for it in our loft, I went on that thing every day for weeks, months even and I don't think I ever wore protection, it's scary when you think about it now but it was the 80's and it was seen as aspirational to have your own sunbed. Yes that's it - if you owned a sunbed you knew you'd made it! How times change! I've never tried once a day stuff because like you, I burn just thinking about the sun so only applying once a day scares me, I will definitely try in the future though. It's interesting how your attitudes change, in my 20's I used factor 8 and wanted to BURN! Now it's at least factor 30! I always use once a day suncream now - so much easier with kids as you're not constantly chasing to reapply (and there's lots more fun things to do!). I burn pretty easily as well so have memories of horrific sunburn a few times. I've used P20 and Boots version but I love ultrasun as it protects against UVA as well, which they don't all. Interesting read! I love that there are so many gentle, well made products now. Sun protection is so important! I love all your photos! Great review! The effect of sun rays also changed in years so stronger protection are necessary. It's just amazing now how varied these sun protection products are. Would love to try that once a day cream. that would be less hassle than other which I need to re-apply after some hours. Sounds like a great suncream. As a natural redhead of the 80s and 90s I too burned like no one's business. We didn't have suncream at all back then where we lived. I'm constantly checking for skin cancer now! I am a redhead too and have been burnt like that too, when i was a young girl. might look into calypso though, not heard of this make before. I recently read that there's a huge spike in malignant melanoma patients in their 60's and 70's - not surprising when you think about their attitude to sun protection. My dad still won't wear any (he's 77). 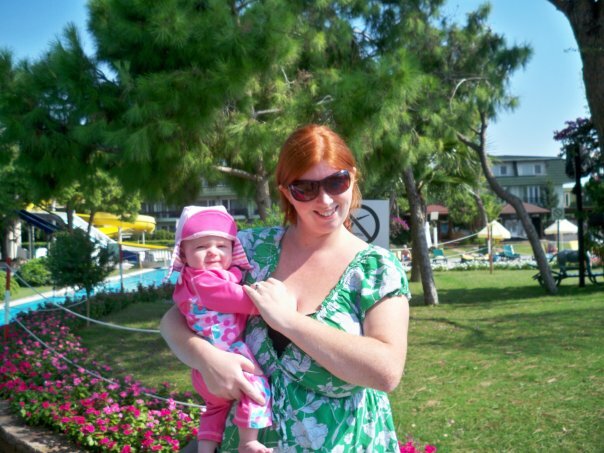 I was a redhead and so is my son (although my daughter takes after her dad). I hate sunbathing so usually avoid it but if we go to the beach it's head to toe suncream but more than once a day. We tried the once a day cream a few years back and I agree, yes a real game changer. They do stain clothes though if you drip it on them, eek! My girls live in their uv suits in the summer. I haven't tried Once a Day Cream yet but it sounds fab! And as I'm only a year younger than you I totally agreed with every word you said about how attitudes towards sun protection has changed. All my friends used sunbeds as teenagers. I'm just glad I was too scared to go on incase I lost the goggles and ruined my eyesight! I use sun cream every day as a moisturiser, even in the winter. My parents never used sun cream and that scares me.